Pumpkin Pasta night is the most awaited night of early Fall. I came across this recipe several years ago on Rachel Ray's 30 Minute Meals show, made a few tweaks and it soon became a seasonal favorite to rival any comfort food. The Spinach Apple Salad is the perfect add for a well rounded meal. Because we're a gluten-free household, brown rice penne pasta is used in place of wheat pasta and of course raw cream instead of pasteurized. Heat a large, deep skillet over medium high heat. Add 1 tablespoon of coconut oil or butter to the pan and brown the sausage in it. Transfer sausage to paper towel lined plate. Drain fat from skillet and return pan to the stove. Add the remaining tablespoon oil or butter, then garlic and onion. Saute 3 to 5 minutes until tender. Add bay leaves, sage and wine to the pan. Reduce wine by half (about 2 minutes). Add stock and pumpkin and stir to combine. Continue stirring until sauce comes to a bubble. Return sausage to pan, reduce heat and stir in cream. Add cinnamon and nutmeg and salt & pepper to taste. Simmer mixture 5 to 10 minutes to thicken sauce. Place drained pasta on serving dish. 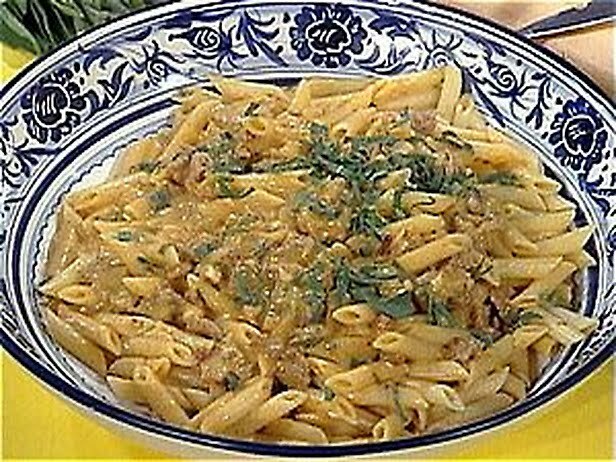 Remove the bay leaves from sauce and pour sauce over pasta. Garnish with lots of shaved cheese and sage leaves. Toss spinach, apples, onions, walnuts and cheese in a salad bowl. Pour oil, vinegar, mustard, honey, fennel seeds, salt and pepper in a small jar or container with a tight lid. Shake to combine dressing for about 1 minute. Pour dressing over salad, toss and enjoy!